"Language holds a special place in human life. It provides the dominant medium for social interaction helping to enable the distinctive forms of organization that we call cultures. Likewise, it provides an important medium of psychological representation, helping to constitute the distinctive forms of thought we call mind. As language mediates both culture and mind, it necessarily draws all three into a close-knit relationship. Though few doubt the importance of language, we still debate just exactly how large a mediating role language plays and precisely what ways" (p. 1) The opening paragraph of the lead paper by John Lucy clearly sets the main theme and the purpose of this voluminous collection of essays under the title Language, Culture and Mind. 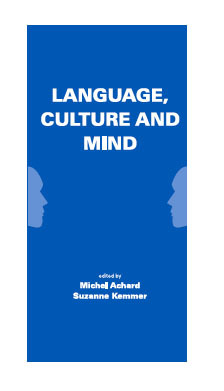 In this book, Michel Achard and Suzanne Kemmer present thirty-five original essays bringing together work at the crossroads of linguistics, psychology, philosophy, cognitive science and related fields. This collection of seminal essays represents a wide spectrum of perspectives, methodologies, and theoretical frameworks. Some perspectives and methodologies represented among the papers are corpus-based methodologies, discourse analysis, language acquisition, contrastive analysis, psycholinguistic experimentation, and language change and grammaticalization. Some theoretical frameworks deployed in the various analyses are Cognitive Grammar, Construction Grammar, Metaphor Theory, and Mental Space and Blending Theory. What unites all of them and brings them together under the title Language, Culture and Mind, is that each addresses in its own way the age-old problem of the way that language relates to human culture and cognition with an emphasis on how language is produced and understood in context. The overarching theme of the volume is that language is embedded in the social and cultural reality of language users, and that such social and cultural knowledge is necessarily entwined with the cognitive structures that form the matrix for linguistic knowledge. Topics considered include human categorization, cognitive and cultural models, embodiment, and the experiential basis of categories and conceptual structures, lexical and constructional semantics, and the distribution and formal properties of linguistic elements and constructions in wide variety of languages. Lucy in his paper directly addresses the nature of the three-pronged relation of language, culture and mind. He asks the question, to what extent does linguistic form matter for thinking? According to Lucy's results, derived from controlled experimentation, speakers of languages of different structures, do, in fact, show differences in the ways the conceptualize domains of knowledge associated with those structures, as evidenced by systematic differences in non-linguistic behavior. The rest of papers in the volume vary as to whether they address the relation of language to thought and culture in the specific instantiations of these concepts, or their general one. A fair number of papers in the volume stress the embedding of language in its specific social and cultural context. Bergen, for example, uses cultural models and blending to analyze and explain political discourse, specifically the editorial cartoons published in the week following 9/11. Chen shows the interplay of emotion and cognition in the discourse of insults. Kelly and Halvarson's paper, in which they investigate the linguistic means by which an on-line community in computer-mediated discourse can be established, highlights the social dimension. The relation of discourse and grammar is brought to fore by Wouk as she explores what conversational data can tell us about linguistic categories, specifically, the clause and verb phrase in Indonesian. Bergen and Binsted study how particular linguistic constructions can be used as a basis for reasoning involving pragmatic scales, and how the creative use of such reasoning can be deployed for humorous purposes. A few of the papers in the volume are explorations at a more metatheoretical level. For example Adamson explores how some basic ideas in Cognitive Linguistics are received in contemporary philosophy. Israel, Harding and Tobin compare simile with metaphor and show how simile is distinct from metaphor in terms of both discourse functions and the cognitive processes that it involves. There are several more papers on metaphor as it is a topic of intense interest among those who see a close relation between language, thought and culture. Moder brings to bear psycholinguistic experimentation to demonstrate how can have a profound influence on the interpretation of metaphorical noun-noun combinations in natural discourse, whether they are novel combinations or not. Stefanowitsch uses linguistic corpora to study the mappings found in emotion metaphors in English and German. Moore continues the metaphor theme but shifts the focus to space, with his study distinguishing two kinds of cognitive frames of reference found in space to time metaphorical mappings. Kabata and Lee observe how certain special particles that appear to have similar semantics in Japanese and Korean are actually subtly different, O'connor's paper studies the category of "associated motion" in Chontal, and shows how its event structure is metaphorically mapped onto analogous temporal conceptual structures via a grammaticalized construction having its own particular narrative functions and semantic effects. Another paper focusing on motion event is Tanangkingsing's contribution. Several of the papers in the volume focus on corpus methodology. Nordquist compares the structures found in elicited data and in linguistic corpora, arguing that differences found in two kinds of data are the result of differences in the mode of processing of the two kinds of language. Gries and Stefanowitsch elaborate their suite of "collostructional" methods, analyzing the frequency interaction of multiple elements in constructional slots. There is also a sequence of papers on the linguistic expression of causation. Song and Wolff, for example, use psycholinguistic experiments to confirm the link between linguistic expressions of causality and the perceptual properties of events, and thus provide evidence for the distinction in conceptual structure between direct and indirect causation. Degand's paper investigates two causal connectives to show that they differ significantly in the property of Speaker Involvement and other semantic and discourse functions. Huumo's paper, in which he studies fictive directionality in Finnish expressions of vision, and Johnson's paper about the verbs of visual perception and their complements in child language are two essays on the linguistic expression of visual perception. There are also a number of papers by McDaniels, Rice and Newman and Lubbers Quesada on aspect. Natural discourse is also the object of study and data source in some of the papers. Vazquez Soto centers her attention on the discourse categories of focus and topic in Cora, while Dancygier uses conceptual blending and mental space theory to analyze how different referring expressions in narrative can be deployed for particular cognitive and discourse functions in constructing meaningful discourse. Scheibman's paper turns to conversational discourse to study the formal and functional properties of the English pronoun we. The paper by Gabas Junior and van der Auwera adds to the literature on ideophones with data from the Amazonian language Karo. Another such recalcitrant type of linguistic expression is the morpholexical blend, the topic of the contribution by Gries. Papers by Jiang and Horie and Kondo offer conceptual analyses of Chinese and Japanese, respectively. One of a number of papers in the volume linking a constructional approach with an empirical corpus-based methodology is the contribution by Boas. Another corpus-based contribution to English syntax is Heyvaert's paper. Davidse, in his paper, continues in the nominal realm with an account of English determiners. Ronald Langacker provides a new and revealing account of the intricacies of finite clauses and their complements. Throughout the volume there are many interlinking and recurring themes and subjects of interest. This volume offers a rich panoply of ways of approaching the vast and deep set of questions and issues that arise when we explore the relations between language, culture and mind. I think this is a very useful collection of essays for the researchers and academicians in linguistics, psychology, cognitive science and philosophy. I heartily recommend it as both a valuable tool for classroom use to facilitate discussions for any classes in philosophy and psychology of language, or in linguistics and cognitive science, and also for initiating further research in related fields.